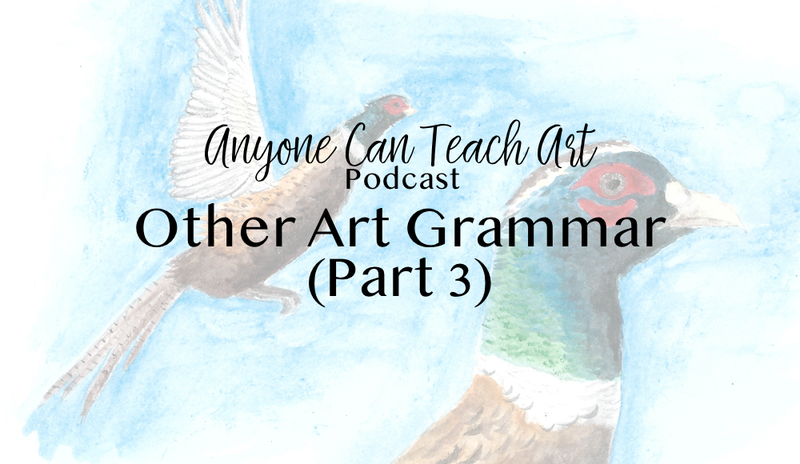 Today we’re talking about the other five components of the grammar (basics) of art: Techniques / Media, Skills, Purposes of Art, Art History, and Art Appreciation. We’ve already covered the first two in great detail because they have so much to teach us about art. Today we’re going to go over the other five components fairly quickly. Technique/Medium Examples: Pencil/graphite, Charcoal, Ink, Watercolor, Acrylic, Oils, Pastels, Fiber, Clay, Collage, Mosaic. There are pro and cons to each medium, so it’s good to experiment with different media. Each medium requires unique skills. So, plan on taking time to learn each one. You can experiment, but a book, a class, or video will make the learning faster. Pros: New media can be very exciting, different students will naturally take to different media, and a little exposure can help overcome the fear of a medium you’re never tried. Cons: Students never have enough time to really learn any one medium, art teachers have to purchase more supplies, and some students will frustrated at never becoming proficient at any one medium. Look for a book, class, or video about THAT medium to speed up the learning curve. Use tracing when starting a new medium so students can focus on the skill of that one medium. Otherwise, the student may be working on too many skills all at once. Carefully pick which medium you want to take when traveling. We reccomend picking only one medium per trip, just to simplify. Deanna recommends traveling with a small set of higher quality watercolor cakes and an aqua brush. Drills for Skills! Work on skills with specific drills! This is why I try to introduce a new skill with each art lesson I write. The “Every piece is a Masterpiece” mindset can easily creep in. However, we need intentional practice, not Masterpiece making, to improve on a skill. 10,000 hour rule from Malcom Gladwell’s book Outliers says we’ll need about that many hours of practice to get good at any one thing. The Equal Odds rule says we won’t know when what we’re creating is going to be great! (James Clear’s short book, Mastering Creativity) So, keep creating in quantity! The first thing to teach students is just the fact that there ARE different purposes. Before you dismiss a work of art, consider what it’s purpose was. This expands our definition of “art” and helps us appreciate all types of art and all types of cultures. There’s so much we can learn within the component of Art History. First, just realize the fact that there are different periods of art history and each period has some defining characteristics. In the grammar stage, you also want to introduce the concept that culture affects art AND art affects culture (even if students can’t provide examples as evidence). We’ll be doing more podcast episodes soon about specific art periods and specific artists to correlate with our 2018 lesson plans, which cover the Ancient through Renaissance periods! Stay Tuned! 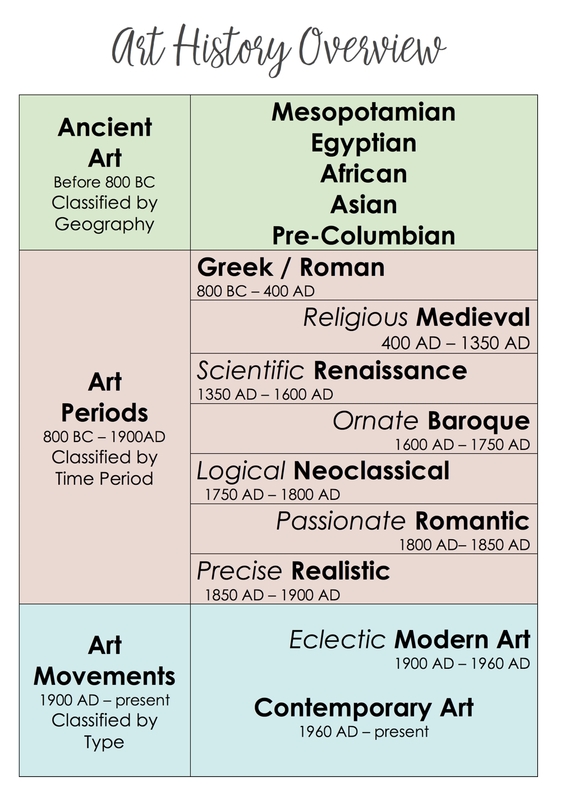 Why did we make Ancient art history lesson plans this year? We never get to study ancient art in Classical Conversations’ “Great Artists” studies. We’re studying ancient history this year in Classical Conversations. Much of what we know about different ancient civilizations is from their art. Art Appreciation is all about looking at, asking questions, and thinking about works of art. This is where we put together all the other components of Art Grammar. Art Appreciation starts in the grammar stage but becomes robust in the dialectic / logic stage. While students are young, we just want to let them talk about what they see. There are no right or wrong answers. Students don’t have to defend their statements or draw specific conclusions, as they would in the Dialectic stage. What story is this art telling? What questions do you have looking at this art? Where do you see the 7 Elements of Art or the Principles of Design in this art work? Does this art remind you of anything else? How is this art similar to other art we’ve looked at? How is this art different from other art we’ve looked at? When was this work of art created? What else was happening in the world? What can we learn from this about the artist’s culture? What do you feel looking at this piece of art? What do you think the artist was feeling when he/she created this? You’ll gain a better grasp on what the Grammar stage is, when you understand the other stages. This knowledge will help you properly identify when your students are fully into the next stage. You’ll gain confidence in the Classical Model when you understand it as all whole. Knowing all three stages can help you in your own learning. Julie’s also been keeping her Sketch book open and handy and it’s been a great encouragement to keep sketching. Deanna has been sick and doing large scale clean out, but hopefully she’ll be better set for creativity now!